It is time to plan for next year! Here's a timeline of what to know and do for registration, tuition and tuition assistance (FACTS). HT has partnered with our local Catholic schools to host a Family Night at OMSI. There are 1500 spots for a free evening exploring OMSI's fun and innovative exhibits. RSVP using the link on the flyer. We look forward to seeing you! SIGN UP EARLY! Children of Eden Jr! From the musical theatre greats, Stephen Schwartz (Godspell and Wicked) and John Caird (Director, Les Miserables), comes a joyous and inspirational musical about parents, children and faith... not to mention centuries of unresolved family business! An expansive musical, Children of Eden Jr. has plenty of roles and life lessons for everyone. Click here for Production Information and Registration Form. 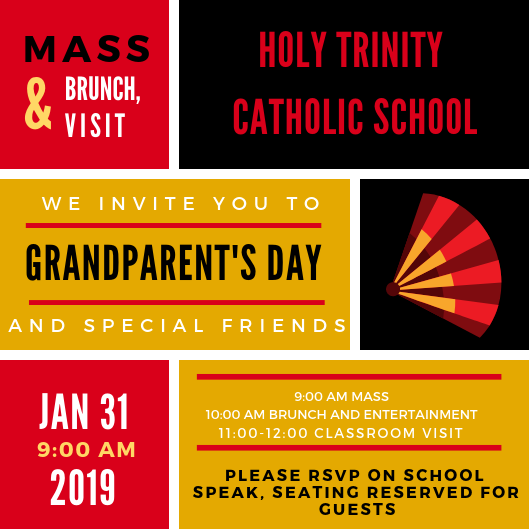 Grandparent's and Special Friend's Day is coming soon! This is a super fun annual event at HT. Volunteers are needed to make this event a success! Please check School Speak for opportunities. If you have any questions, please call or text Jacquelyn Delplanche (HT parent) at 503-547-3872.